With the F5 Corpus VS, there are no compromises. We combined all of the features of the world-renown Corpus seating system, along with standing functionality. 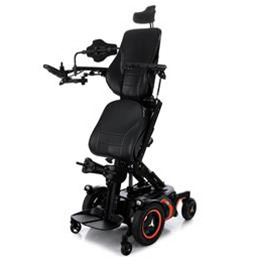 With the F5 Corpus VS, users may stand and drive at any point of the stand sequence, and the redesigned chest bar offers added comfort and stability. The F5 Corpus VS provides an array of benefits from social interactions like being able to talk to someone face-to-face to positive health outcomes like greater pressure relief and improve circulatory, GI and respiratory systems.